Chisinau has approved the sale of a 64% stake in Moldindconbank S.A., the second largest by its assets bank in Moldova, to Bulgarian DOVERIE UNITED-HOLDING PLC. Moldindconbank S.A. was involved in large-scale international scandals about which Bivol also wrote. The scandal, known as the “Laundromat”, is associated with the laundering of USD 22 billion from Russia – as well as the syphoning of over USD 1 billion from the Republic of Moldova’s banking system – an affair called by the local media “the theft of the century”. In less than a week, the key document for the realization of the deal has been issued and the buyer has been approved by the Moldovan Parliament. This hurry seems to be related to the upcoming elections, says economist Tatiana Laryushina. As Bivol reported last week, the owner of Sopharma Pharmaceuticals Ognian Donev and the owner of Darik Radio (revealed to have been a collaborator of the Communist regime secret services with the alias “Karak”) are becoming top bankers in Chisinau. Their joint venture DOVERIE UNITED-HOLDING is purchasing 63.9% of the shares in Moldova’s Moldindconbank S.A. (MICB), as revealed on January 22, 2019. Since then, events have been developing very quickly. On the next day, January 23, the National Committee for Financial Stability of the Republic of Moldova offered to Prime Minister Pavel Filip’s government “to start negotiations with the potential buyer” of MICB. “The measures are analogous to the best practices of European countries and have already been successfully undertaken last year in the sale of Moldova-Agroindbank S.A.,” was the official position of the National Bank of Moldova (NBM) on the occasion of the meeting. The Public Property Agency (Agenția Proprietății Publice – APP) of the Government of the Republic of Moldova has prepared a draft decision for the formal approval of the acquisition of the controlling stake in Moldindconbank S.A. by the Bulgarian DOVERIE UNITED-HOLDING. The deal will be realized through the subsidiary company Doverie – Invest JSC. The company is registered at the main office building of Sopharma – Sopharma Business Towers in the Dianabath district of the Bulgarian capital Sofia. The registered capital of the company, incorporated only on 18 December 2018, is BGN 5 million. “It is not quite normal for the capital to be below the price of the deal, but what is more important is the guarantees of this company – otherwise it is a global practice to have minimum capital for a certain business goal,” said business journalist Ion Preasca of Mold Street and of the center for investigative journalism – RISE Moldova – Bivol’s Moldovan partner in the Organized Crime and Corruption Project (OCCRP). The draft decision, published on the site of the Government of the Republic of Moldova, has not yet been approved. There are no number and signatures or seals on it, but there are special blank spaces for them. The draft decision has been prepared by Finance Minister Ion Chicu and the Minister of Justice Victoria Iftodi. It is to be signed by them and Prime Minister Pavel Filip. APP’s instructions for the sale are set out in six points, such as to carry out the procedure tested in the sale of the largest bank by assets in Moldova – Moldova-Agroindbank (MAIB). The purchase of MICB shares is forthcoming and then they will be resold to a foreign investor, approved by the regulator. “The purchase of the newly-issued shares in Moldindconbank S.A. is approved by the Public Property Agency on behalf of the government,” says the draft decision of the Cabinet in Chisinau. Bivol was the first to announce the price of the deal: “3,173,751 shares, worth RON 760,113,364.50 or about EUR 39.14 million”. According to item 2, the Ministry of Finance of Moldova will provide APP with “the necessary amount to buy the shares issued by Moldindconbank S.A., as well as to cover the costs associated with this transaction. According to item 3, the acquisition of the MICB control package by Doverie – Invest is de facto allowed. Under item 4, equal conditions for bidding and selling will be provided to a potential buyer that has signed the Preliminary Contract, on equal terms with other potential investors that have received approval from the NBM. Item 5 states that APP’s Director General Vladimir Baldovici is authorized by the Prime Minister of Moldova to sign the contracts, for both, the purchase of the MICB shares and their subsequent resale to the Bulgarian DOVERIE. According to the sixth item, “this decision shall enter into force on the date of its publication”. Bivol has the draft decision of the Moldovan government, as well as the attached to it APP draft agreement for the forthcoming sale of the MICB share package to the Bulgarian company Doverie – Invest JSC – a 50-page document in Romanian. At the same time, only a week later, on Monday, January 28, DOVERIE’s representatives visited Chisinau, according to the Moldovan Parliament’s website. Parliament Speaker Andrian Kandu has held talks with the “management of a European investor” with interest in “investing in the financial and banking sector” of Moldova. “Following the banking crisis that our country underwent, we adopted a comprehensive legislative package to improve the financial and banking sector in order to make it more attractive to foreign investors,” the Parliament’s press office quoted Kandu, after his meeting with two of the top managers of DOVERIE. “On their part, the representatives of the Bulgarian company expressed confidence that the announced investment will allow for the modernization of the sector as their company has a substantial international banking experience,” reads the press release. 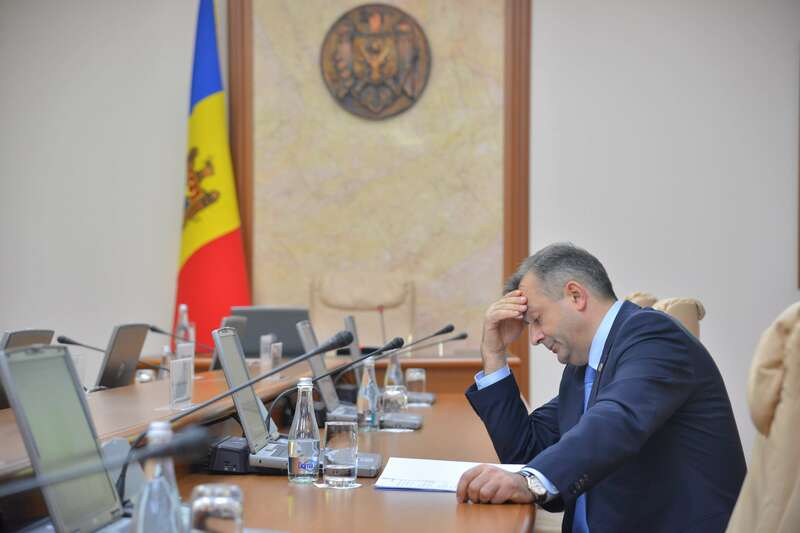 As RISE Moldova found, Andrian Kandu is one of the figures who have managed the countless offshore companies of the Chairman of the ruling Democratic Party of Moldova (DPM) – oligarch Vladimir Plahotniuc and has experience in the American PriceWaterhouseCoopers (PwC) which is engaged in auditing and accounting. One explanation for the extremely swift reaction of the Moldovan authorities may be the upcoming elections. The general elections in Moldova are scheduled for February 24, 2019. Until then, even Prime Minister Pavel Filip, who is on pre-election leave, does not have the right to actually sign the Cabinet’s documents. According to Preasca, it is precisely because of this that the work on the deal is entirely tasked to the APP Director General. According to the respected Moldovan economist from the Institute for Development and Social Initiatives (IDIS) “Viitorul”, Tatyana Laryushina, the pre-election situation is extremely favorable to the authorities in Chisinau, which explains the quick decisions about the fate of MICB. “The motive is not even that much related to the elections, it is simply a good time to push the deal in the period between two Cabinets,” Tatyana Laryushina told Bivol. According to her, if there are any doubts about a conflict of interests of the Bulgarian investor (Sopharma is the owner of a chain of pharmacies in Moldova), it is normal not only for the NBM but also the Ministry of Finance to start a probe. According to her, the NBM for now reports only to the country’s Parliament, although it has such obligations to the creditors as well – the International Monetary Fund (IMF), the World Bank (WB), the European Bank for Reconstruction and Development (EBRD), and others. Speaking before Bivol, the economist urged the NBM to disclose all their due diligence and screening procedures and all related documents to show the transparency of the ultimate beneficiaries from the buyer company.